The 2011-2012 IABC/Chicago Board of Directors has selected Joanne Kitsos, ABC, as the first recipient of the Karen Utterback Award for Volunteerism. Mrs. Kitsos received the award at the 2012 IABC/Chicago Bronze Quill Award dinner reception. At the time of the award, Mrs. Kitsos was a senior consultant with the Blue Cross and Blue Shield Association (BCBSA) and based in the Chicago office. She focused on developing and implementing strategic communication plans Association-wide, provided counsel to clients throughout BCBSA and supported the Association’s internal communication program. An award-winning communicator, Kitsos has more than 20 years of corporate communications experience across a variety of industries. Prior to joining BCBSA in 1998 as manager, Internal Communications, she was assistant director of Public Relations at the Chicago Sun-Times. Previously she managed internal communications at Sara Lee Corporation and provided communication support to the Sara Lee Foundation. Before that she was managing editor at Arthur Andersen & Co.
Kitsos has been an accredited business communicator (the designation is from the International Association of Business Communicators) since 2004. 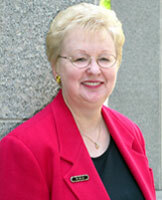 She has been a member of IABC for more than 25 years and served on the IABC/Chicago Board of Directors for six years. Kitsos was a co-director, Accreditation for several years and was director, Member Retention in 2002-2003; she also served on the Awards, Programs and Public Relations Committees. She co-authored the 2007-2008 Value of Accreditation Study, which clearly links accreditation to the strategic communication value to organizations, clients and to the enhancement of the communication profession. In 2010, Kitsos was the first recipient of the IABC’s prestigious Rae Hamlin Award, which was given in recognition of her volunteer service to Accreditation Program Development. She earned a Bachelor of Arts degree from Northeastern Illinois University.